When you’re in the business of creating great hair, especially over the busy, event filled, Christmas and New Year periods it’s inevitable that there will be an extra sense of fulfilment and love for your job. Seeing all of your fantastic clients walking out with great hair is fulfilment enough, but knowing they are heading into an extra special time of year makes that feeling even better! 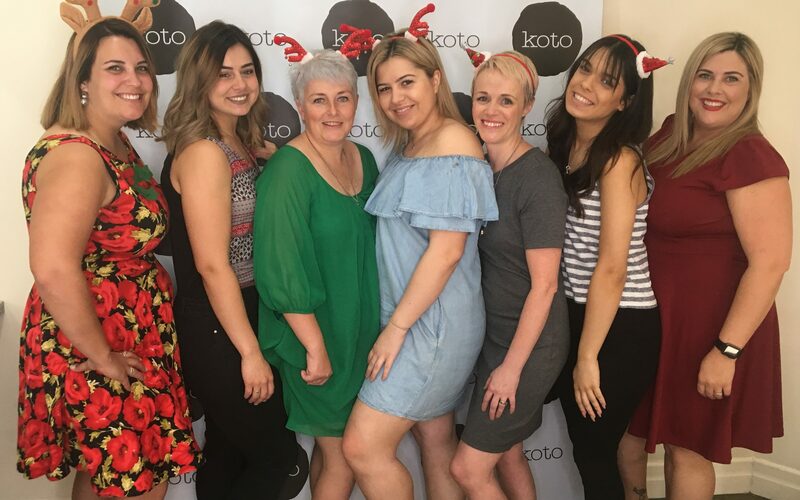 We love our jobs, especially here at Koto Hair, but we do call it the silly season for a reason. We have back-to-back bookings with minimal rest time in between and the majority of those bookings have been in our system since July. Crazy right? Fully booked for December, six months in advance. It hits the middle of the year and clients start scheduling their 4-6 week appointments so that they match up with Christmas time. No one wants regrowth on Christmas Day! Those six day work weeks become bigger and bigger, with us often having to work 10-12 hour days to make sure all of our clients are exquisitely cut, coloured and blow waved for Christmas. We usually skip lunch. So a huge breakfast and scoffing our faces after we leave for the evening is usually in order during the festive season. Sorry metabolism, we’ll sort you out when we have the time. We could eat lunch as we work, people in offices do it. Surely our lovely clients wouldn’t mind the basin treatment with added crumbs? We won’t charge you extra for them, promise. The festive season brings extra men. Either their partners have hounded them or they just like to look extra good during Christmas too. This means at the end of the day, we get to go home and proclaim “we did so many men today” – our husbands even sound just a little bit proud of us. It gets to the point where they don’t even blink an eyelid. We have 5 minutes to pee. So at the same time, of course, we reply to texts, emails and check our social media. The clock ticks, but we get it done, all whilst our client’s colour is processing. We’re on our feet all day, feeling the energy and the vibe that this season creates. Sometimes this means we get home only to scull the random bottle of wine in the kitchen whilst we collapse onto the lounge. Although, it’s busy, it’s wonderful. We catch up with our clients, we feel the love, we create magic with our colleagues and it just confirms to us, over and over, why we have the passion that we do for our craft. We’d love to see you this Christmas. Just make sure you booked back in July. (ONLY JOKING) – Call us, remember we’re extra efficient this time of year; we’ll see what we can do to help! You have a truly gifted bunch of talented women……no bias of course. I look forward to visiting again in May, but in the interim, have a festive Yule and a refreshing New Year. Booking an appointment online couldn't be easier. Alternatively, you can give us a call, we would love to hear from you. Click here. Share your Koto hair experience with your friends and family and we’ll share our appreciation by rewarding you with $20 off your next service. Visit our Promotions page.